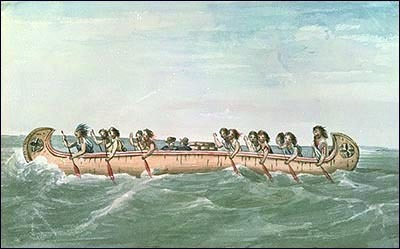 ierre-Esprit Radisson and Médard Chouart des Groseilliers are considered the first voyageurs. 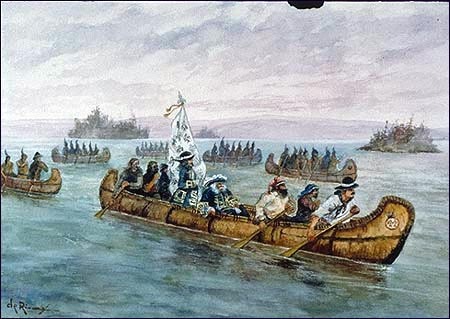 They spearheaded the mid-seventeenth- century fur trade and inspired the founding of the Hudson's Bay Company in 1670.
he expansionist Governor of New France, Louis de Buade de Frontenac, en route to Cataraqui (Kingston) on Lake Ontario in 1674 where, over the objections of officials, settlers, and fur traders, he established a new trading post. 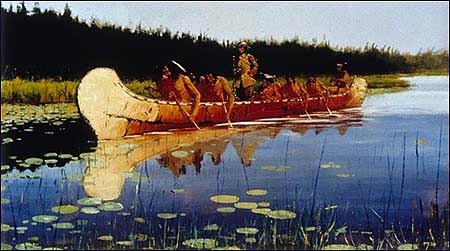 Montreal Canoe with Hudson's Bay Company officials making good time on open water. As the economic historian Harold Innis noted, ". . . canôts du maître were important items in the trunk line from Montreal to Grand Portage . . . , "* using routes along main rivers and across the Great Lakes. * The Fur Trade in Canada (Toronto: University of Toronto Press, 1970), p. 218.